The first thing that comes to mind when I hear the word “Empire” is the 1990 album by Queensrÿche. Sure, 1990 was a long time ago, but it was their true breakthrough into the mainstream. Today, that album still brings back good memories, but the Empire in the forefront of my mind is the restaurant at 575 Congress. It took me about two years to get there which is ridiculous considering my love of Asian food, but I finally did and was surprised that the place was absolutely mobbed; the wait was nearly an hour and we were there early. Without delay, we went to the bar to wait for a table and took a look at the drink menu. There were beers and cocktails on one side and wine and sake on the other. I wasn’t going to have anything until I saw the Foolproof Brewing Peanut Butter Raincloud Porter served with a peanut butter cup. I just can’t resist anything with peanut butter so I plucked up one of those. She decided on the 88 Mai Tai – rum, honey, juice, grapefruit and elderberry bitters with a Myer’s float. A few minutes after our order was placed we received our thirst quenchers. Mine unfortunately did not have a peanut butter cup as promised. It was somewhat of a disappointment for me, but that was assuaged some when I tasted the beer and realized it was excellent. The peanut butter was nearly non-existent, but it was still probably the best porter I ever had. My wife happily sipped her mai tai. We stood by the bar drinking and inevitably blocking the staff trying to get through from the dining room. As we neared the end of our drinks, a duo of spaces opened up at the bar. Without hesitation, we pounced like honey badgers on the attack and took the seats for which we were next in line. One of the bartenders provided us with food menus and offered to take our orders whenever we were ready. We looked carefully at our options on the one-sheet menu which offered dim sum, traditional favorites, and rice and noodles flanked on either side by small and large plates. I was up for whatever food the night brought and the other half and I discussed the possibilities, settling on the idea that we would order a bunch of food to share. We decided to start with some small plates. I suggested the Sa Cha Chicken Skewers, but we instead settled on Lobster Rangoons – wasabi tobiko, scallion – and Garlic Green Beans with roasted garlic and grilled onion. I was excited about our choices and we placed the order noting that we would eat those dishes and probably get more after. One of the bartenders was particularly bubbly and we chatted with her a bit as we waited for our food. At one point, as it neared the time when we should be getting our plates, she went to check on them and we received two platters of joy only seconds later. I requested silverware and hot mustard and both were delivered quickly at which point I was ready to stuff my face full of everything I could fit in it. I started with Lobster Rangoons, trying a bite plain, one with the rangoon sauce, and one with the hot mustard. They were awesome with a capital “AWE” – undoubtedly some of the best rangoons I ever had. They were well-stuffed with the lobster and cream cheese concoction. After quickly downing two of those, I switched to the long, green garlic veg. Those were also delicious with flavor for days – an outstanding example of the dish and certainly the single, best I had ever tasted. We quickly ate through our very tasty food and started to consider our next dinner moves. After a short period of indecision, we agreed on the Lobster Dumplings and Kung Pao Chicken – lightly spiced cage-free chicken, roasted peanuts, thin noodles. 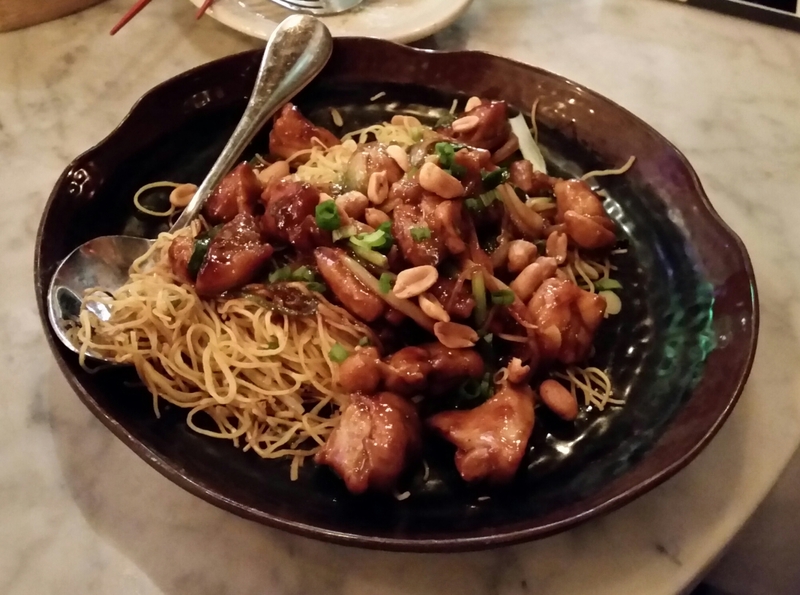 We had considered the Chicken Teriyaki, but decided that the Kung Pao was where it was at. After throwing those items at the kitchen, we happily waited for our second round of food nuggets. Our dumplings came out shortly after we ordered and just after that, the chicken made its way over. I was pleased to see that the dumplings were steamed and not fried. I started with one of those. They were a little difficult to maneuver. There was plenty of lobster filling in the doughy delight, but the outer shell was still relatively oversized, so cutting it in half meant possibly having all the lobster in one of the halves and none in the other. Nonetheless, a little extra work put the dumplings in my mouth with proper proportions of the filling where they needed to be. These again had potent lobster power and combined with the provided ginger sauce offered a whole lot of love to my tastebuds. Dumplings went down the hatch smoothly and we moved on to the Kung Pao Chicken. I was excited to try it with the noodles instead of the traditional rice. I grabbed a bite and was very pleased. The sauce was plentiful with the typical sweet flavor, but I think the most impressive part of the dish was the chicken. It was much higher quality than the typical Kung Pao bird. Gone was the fatty, low-rent poultry generally found at traditional Chinese eateries and in its wake were lean, tender pieces of the feathered beast. Happiness with the food was turning out to be the theme of the evening as I finished the chicken. I was really fond of the noodles as a change of pace. Again, the dish was a shining example of what others serving similar food should strive for. It was simply a better version of what I had eaten 100 times before. We ate it all and asked the bartender what was available for dessert. After hearing the list of choices, we decided to have some steamed buns with nutella, banana, and a side of warm chocolate sauce. There was a long wait for dessert which we were eventually told was due to the kitchen having run out of our buns and needing to make them fresh. That sounded good to me; I wasn’t in a rush. They did finally come out and we found two of the steamed spheres hiding some banana slices and the hazelnut and chocolate spread. I cut one in half and dipped it in the chocolate sauce. It was quite yummy and didn’t have the overpowering sweetness that I was looking to avoid. The soft texture of the bun was also a pleasing note. After we finished with our food, I couldn’t help but think that we’d probably just have been receiving our first course if we had waited for a table. We got the bill and our total came to $77 after tip. I had eaten just enough to feel good about my life and not too much to feel disgusting. Empire definitely made an impression upon me. I couldn’t believe how busy they were and after eating, the reason for that was clear; their food was really, really good. They certainly offer plenty of the traditional dishes you would find at most Chinese restaurants in the area, but they offer a unique version of them with plenty of local ingredients and they also offer items you won’t find at those other restaurants. If you’re looking for Chinese food in Portland, Empire is most certainly the place to go. The food is majestic and as a result we left smiling and I was calm and clear as I drove home in silent lucidity. This entry was posted in Portland, ME food on November 2, 2015 by peterpeterportlandeater. Please include restaurant’s address. It would be nice if you mentioned I’d they had their own or shared parking lot. Enjoy your reviews and have “followed” you after some of your reviews.